Chef Janos Wilder offers modern American cuisine at his downtown Tucson restaurant. 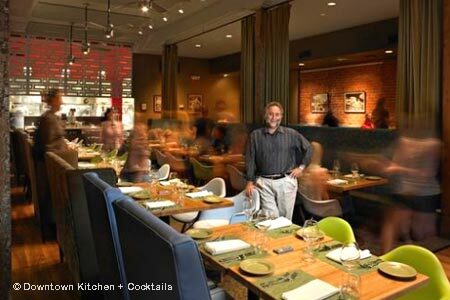 : Year in and year out, chef Janos Wilder brings ‘A Sense of Place’ to his downtown restaurant. Using the best local ingredients was a hallmark of Wilder’s menus long before many of today’s chefs ever held a spoon. Of course, this means that offerings change with the seasons, but you can always find Lily’s Laotian pounded-green papaya salad with its tangle of tastes and textures. Flavors of the Southwest might include short ribs braised in pasilla chiles and a local beer, or perhaps the arroz con pato with a minted aji amarillo orange vinaigrette is your fancy. During the summer months, the kitchen takes diners on in-house road trips with food from cities around the world. If you're looking to enjoy a casual night out, hang in the bar with a house signature cocktail and a “J DAWG,” Wilder’s take on the area’s famous Sonoran hot dog.